One of the many mysteries of life are simply things we cannot explain yet . Our current knowledge cannot grasp what science hasn’t proven yet. The idea of a ‘ Ghost Man appears in a photo’ appearing in a photograph or movie is quite common. Throughout history, such recordings have been discovered, along with ‘ghost’ sounds recorded on tape. Although the truth hasn’t been uncovered as to the origin of these apparitions, they still appear from time to time. Most often unexpectedly, when there is a celebration or a funeral. Whether one believes in ghosts or not, these photos are very real. Of course, there are many that are photoshopped, but not all. People are curious, while others want to believe they were the chosen ones for such a photo. Sometimes the photo is taken at a place where there had been a fatal accident in the past. Paranormal experts examine these cases carefully, deciding whether there was foul play involved. It seems like they will now have a new task in Georgia. 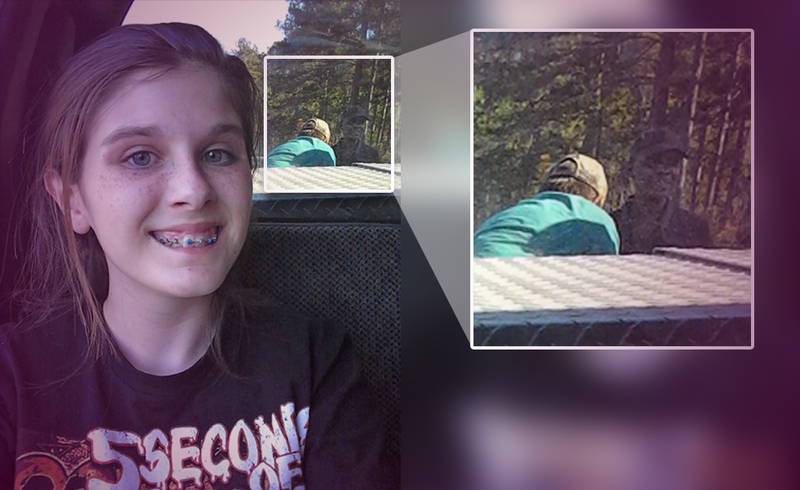 The 13-year-old Haley Ogletree captured a ‘ghost man’ on her phone, while taking a selfie. She and her brother were celebrating the boy’s birthday, fishing. The day was successful, they had a great time and Kolton caught some pretty big fish. What about the photo? According to the mother, nobody else was with them that day. It wasn’t till later that she realized there was something odd about the picture. Is it a coincidence, that another 13-year-old captured another ‘ghost’ only a few months ago? Only that time it was a small child that appeared behind the girl. Yet, the stories are quite similar in many ways. In many cultures, 13 marks the age of spiritual awakening. Could it be the case with these two teenagers? Let’s ask the cards. This card represents the end of a cycle, and the beginning of a new one. It brings with it accomplishment, but also responsibility. So, yes, it is a possibility that both girls witnessed a spiritual event. As with everything else, not all will accept the photos as hard fact. More evidence is needed to form an opinion. There will always be an opposition, who will claim they aren’t real. The girls will need to defend their position, but only if they believe in what they captured themselves. Ace of Wands: Either way, these events were ground-breaking for the girls. There is a great potential here, and only time will tell whether it will be exploited. There is a strong, creative force surrounding them, but they are uncertain which way to go. Acceptance and understanding takes a lot of effort and hard work.